Bergenfield LL: How Can I Help? How Can I Help... VOLUNTEER! The approach of the BLL Board of Directors is to try and involve as many people as possible without overburdening anyone. If you can come out even for an occasional day or two we all benefit. It can be fun and rewarding to know that volunteering your time. Bergenfield has an incredible Little League Complex; but we need your help to keep it well maintained for our players! Bergenfield Little League relies on adult volunteers to help ensure that the organization remains structured and runs smoothly. BLL is always looking for responsible and enthusiastic individuals to support and coordinate Little League events and activities. As a volunteer, you should have an interest in the safety, well-being, and overall development of children. You will discover that the benefits of volunteering are endless. You will make new friends and feel like you are part of something bigger than yourself. You will also gain a better understanding of why you should become involved. Anyone can apply to become a volunteer. Whatever talents or skills you have, we can use them! Any community member who wishes to become a volunteer may apply. 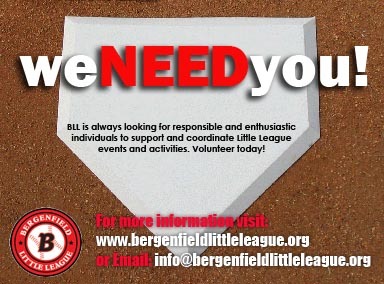 All parents of children involved in Bergenfield Little League are strongly encouraged to volunteer. When you apply to become a volunteer, you give the local Little League organization the right to conduct necessary background checks. or sign up at any of our monthly membership meeting!